Have you been feeling tired lately? Sluggish perhaps, or weak? Are you having difficulty concentrating or are you gaining weight? Are you becoming prone to constipation and muscle aches? Is your skin becoming dry and brittle? Perhaps most crucially, are you suffering from hair loss? These are all signs you might have an undiagnosed thyroid disorder! There are, as you probably know, a thousand and one reasons behind excessive hair loss: stress, environmental factors, genetics, underlying medical conditions, medications, hormonal changes…the list goes on. Hormonal changes, in particular, are extremely common and quite complex to diagnose and treat. While their mechanism is still obscure, their effects can still very much be observed. So if you’ve noticed that your hair is thinning out, and you don’t know why– especially if your hair loss is accompanied with the plethora of other lovely problems highlighted above– ruling out a thyroid imbalance is definitely on your TO-DO list. So let’s look at what your thyroid is, how thyroid imbalances can lead to hair loss, and what to do about them! Your thyroid is a small, butterfly-shaped gland located in your neck. It produces two key hormones, triiodothyronine (T3) and thyroxine (T4) . These hormones regulate all of your metabolic functions, including hair growth! If you’re healthy, most of your hair follicles at any given time are in their growing phase (anagen), while a minority are in the resting phase– telogen. However, the slightest variation in your thyroid hormone levels will throw off your normal hair cycle. And not in a good way! Your hair follicles won’t remain in anagen, will transition to the telogen phase and fall out far too quickly. There are two main types of thyroid disorders, both of which can lead to hair loss. Your thyroid will either secrete too many hormones (a condition called hyperthyroidism) or not enough (known as hypothyroidism). Hair loss most commonly occurs with hypothyroidism, although it can occur with either. Why? Hypo, not to be confused with hippo, comes from the Greek preposition hypo– meaning “under” or “below”. In other words, your metabolic rate slows down, and your hair follicles don’t have enough energy to function optimally. 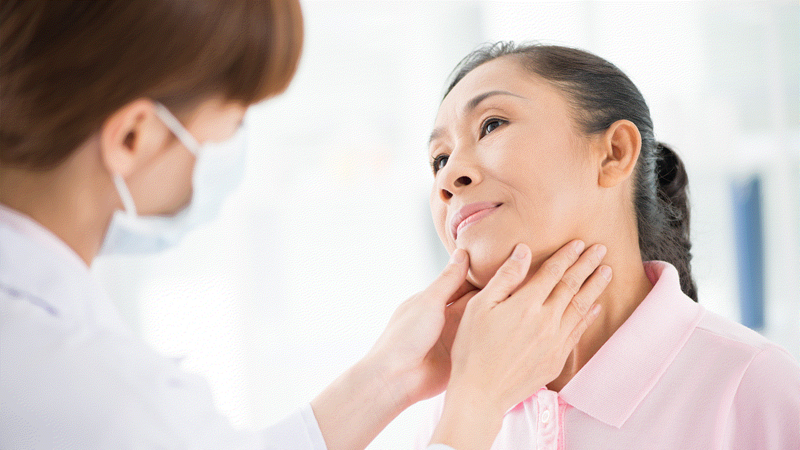 In many cases, an autoimmune condition called Hashimoto’s is the cause of hypothyroidism. This means your immune system is attacking your thyroid tissue, leading to symptoms such as hair loss. Unfortunately, some physicians will not test for the antibodies that determine if your thyroid condition is autoimmune. This is why it’s always important to do thorough research before consulting physicians and choosing to take a course of action. The last thing you want to do is suppress a condition rather than try to treat the root of its cause. However, as you work to treat the root cause of your condition, you may want to protect your in the meantime to restore hair that has been lost and prevent further damage. However, you can naturally treat your hair loss without suffering from ill side effects. You just have to pick the right solution. Many thyroid patients diagnosed with thyroid disorders end up following a regimen of laser hair therapy precisely because it has no side effects and is clinically proven to be effective. A technologically advanced laser hair therapy device, such as the Theradome LH80 PRO, ensures that the mitochondria of hair cells get treated with the perfect dosage of energy to reverse hair loss at a cellular level. And no need to tighten your belt and schedule expensive and inconvenient visits to laser hair therapy clinics. The FDA-cleared Theradome is affordable, convenient and delivers clinical strength results from the comfort of your own home. Thank u for info. It may be thyroid. Have had a scalp analysis and scalp biopsy to determine problem. Can provide info if needed. My hair loss began after an anemia episode and has become much more severe in past 12 months. No lasting help from other sources.